Diwali also called as Deepavali (meaning row of lights) is a festival of lights widely celebrated with grandeur all over India. This festival is celebrated on Amavasya (New Moon) in the Tamil month of Aippasi (mid-Oct to mid-Nov) memorizing the destruction of the demon Narakasura by Lord Krishna to put an end to his atrocities. Diwali is also observed as an event to worship Lakshmi, the Goddess of wealth and receive her abundant blessings. 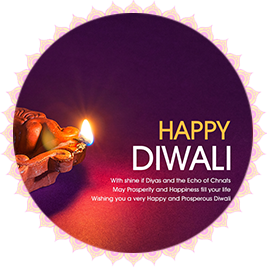 Diwali is celebrated for a variety of reasons; however, this grand festival of lights symbolizes the victory of good over evil and the dispelling of darkness or ignorance by the divine force. This auspicious festival also denotes the removal of darkness from our inner selves and helps rejuvenate our minds and bodies. Diwali, one of the grand festivals of India also involves seeking the grace of Goddess Lakshmi for wealth and wisdom. There are several mythologies associated with Diwali. The celebration of Diwali differs in different regions of India. In Northern states, Diwali is celebrated for four days from Trayodashi (13th lunar day) as Dhanteras on the first day, Naraka Chaturdashi on the second day, Lakshmi Pooja (Diwali) on the third day and Padwa on the fourth day. Each day has its own significance and rituals. In most of the Southern states, Diwali is celebrated for a period of 3 to 5 days before and after the new Moon day or Amavasya. People have an oil bath early in the morning and offer prayers to Lord Krishna, Goddess Lakshmi, Lord Ganesha and Kubera (banker of heaven). Houses are cleaned, and beautiful rangolis (patterns) are drawn at the footstep. The joyous event involves lighting of lamps and bursting of firecrackers, which symbolizes the removal of darkness with light on the clear and dark no-moon sky. People adorn themselves with new clothes and exchange sweets and gifts with their family and friends. Marwari, Gujarati and Nepali New Year is also celebrated on the day of Diwali. She is said to be the daughter of sage Bhrigu who took refuge in the Ocean of Milk and emerged during the churning of the Ocean by gods and demons.